Legend, myth, storytelling, preservation of memory -- these ideas constitute the thematic heart of 'The Sandlot.' For its 25th anniversary, the film returns to theaters July 22 and 24. This year marks the 25th anniversary of the beloved baseball movie “The Sandlot.” To mark the occasion, Esquire published a retrospective that, to its credit, did more than simply catalog the many memorable scenes and quotes from the movie. Instead, the piece engaged with the themes of the story — nostalgia, boyhood, coming-of-age — and highlighted one aspect that distinguishes it from a typical sports narrative: “The Sandlot” isn’t about winning. Legend, myth, storytelling, preservation of memory — these ideas constitute the thematic heart of “The Sandlot.” At its core, the movie is a celebration of mythic stories and a call to keep the past alive. “The Sandlot” opens with the narrator (adult Scotty Smalls, as voiced by director/co-screenwriter David Mickey Evans) providing an exaggerated account of Babe Ruth’s famous “called shot” from the 1932 World Series. Contrary to the voiceover, it didn’t happen in the bottom of the ninth with the tying run on base. The scene also accomplishes the more basic task of connecting Babe Ruth to the story at hand. Specifically, his name(s). Names are important to the scheme of “The Sandlot.” When Smalls, the new kid in town, is formally introduced to the Sandlot gang, he reveals his ignorance (before falsely backtracking) about who Babe Ruth is. Indignant, the guys start rattling off the many colorful handles that Ruth had acquired: “The Sultan of Swat, the Titan of Terror, the Colossus of Clout” and so on. Is it just fun to give characters nicknames? Yes, but that doesn’t do justice to their power. When you’re given a nickname (not a malicious one, I should add), you’re in some small way mythologized. Whether it’s tied to a talent, a personal quirk or otherwise, you become something a little more than what you were before. You’re no longer just your boring birth name. Nicknames help you to live longer in the memory of others. By both linking the boys to the Babe and giving them nicknames, the movie sets the team up as heroes primed for deeds beyond the normal and day-to-day. We’re entering the mythic realm. As the story unfolds, it’s revealed to be full of conventions and types from myth and legend. The main setting, of course, is the Sandlot, which isn’t just a normal playing field. It’s the group’s “little baseball kingdom,” to quote the narrator. Benny is the valiant character who must embark on a hero’s journey to overcome self-doubt and meet the challenge facing him. That challenge takes the form of the Beast, a dog — nay, a “giant gorilla-dog thing” — of local legend that is usually depicted as exaggeratedly huge and monstrous. This is especially true during the “camp out” sequence, in which the Beast’s story is presented as a black-and-white B-movie of highly questionable veracity. Filling in the details of the story, there’s an ill omen (Benny “busting the guts” out of a baseball), a mysterious vision (Babe Ruth, acting as Benny’s guide, visits him in a dream and tells him that “legends never die”), the use of special armor (PF Flyers), the appearance of an old blind sage (Mr. Mertle, played by James Earl Jones) and a climactic confrontation in which Benny must potentially sacrifice himself to tame the beast and retrieve the Babe Ruth ball. Yes, there’s an autobiographical element to it, but doesn’t that still feel like a wink from the director or a clue as to what he’s doing? He’s linking ancient mythology with the mythology of boyhood and baseball, not only to give the story a larger-than-life feel and to celebrate the whole idea of mythology, but probably to say that athletes are the modern version of ancient mythic heroes, especially in the minds of young boys. The most accomplished and gifted — Muhammad Ali, Michael Jordan, Usain Bolt, Roger Federer, and so on — make it hard to argue the point. There’s also the story and mythology of America, “sweet America,” in various details of the plot. Before Benny was “the Jet,” before he had ever even picked up a baseball bat, he had ties to the legendary: his full name is Benjamin Franklin Rodriguez. Then, of course, at the center of the movie is the sublime July 4th night game sequence, which features fireworks aplenty and Ray Charles’ immortal version of “America the Beautiful.” But it’s only after the story ends, in the epilogue, when the group as a whole assumes a more explicit place in the American story. What did they go on to be in adulthood? Benny and Smalls devoted their lives to America’s pastime, as a professional player and announcer, respectively. Then there are the visionary entrepreneurs of the bunch: Yeah-Yeah became a “pioneering developer of bungee jumping,” and Timmy and Tommy invented mini-malls. Squints and DeNunez are the small business owners. Ham entered the world of entertainment as a pro wrestler (“the Great Hambino”). And Bertram “got really into the ‘60s, and no one ever saw him again.” Each represents a strand of the vibrant, audacious, sometimes ridiculous story of America. They’re all little love notes to the American character. The epilogue comes with a touch of sadness as well: the narrator relates that they all eventually moved out of the neighborhood. It’s a poignant scene when we see the individual members of the group disappearing from the Sandlot as their stories are told. And not just because it marks the end of their day-to-day collective friendship. It also represents a threat to the memory and transmission of the stories associated with them. An intact community provides the foundation for a story like theirs to come into existence and endure in memory, as it’s retold again and again. But the disruption of community cuts against an active storytelling culture that preserves knowledge of the past. This is why “The Sandlot” stresses the necessity of creating chains of memory and preserving the past. It was Smalls’ ignorance of the past (i.e., not knowing who Babe Ruth was) that triggered the gang’s problems in the first place. This is where Mr. Mertle, “the old blind sage” and owner of the Beast, filled the breach, in a sense. After Benny tamed the Beast and reclaimed the (badly disfigured) Babe Ruth ball, Mr. Mertle offered to trade them an even more valuable ball — one signed by the 1927 Yankees team — on one condition: they stop by once a week to talk baseball. This is his contribution to keeping the past alive and passing on traditions to a younger generation. And there’s a similar function to Smalls’ career choice. He becomes a sports announcer, a profession that at its best involves storytelling and myth making and passing along legends. Think of Vin Scully or the indispensable, incomparable Bob Uecker. Big, generous personalities and master storytellers. The final scene of the movie shows Smalls in his booth at Dodger Stadium donning the fish hat that Benny had advised him to burn and looking at a picture of the Sandlot gang from that magical summer — frozen in time but still powerfully alive in his character and identity. It points to a basic but profound truth: the stories we hear and tell ourselves — about our family, our community, our country, our belief system — give meaning to our lives and form us into the people we are. Not bad for a kids movie about baseball and an English Mastiff. 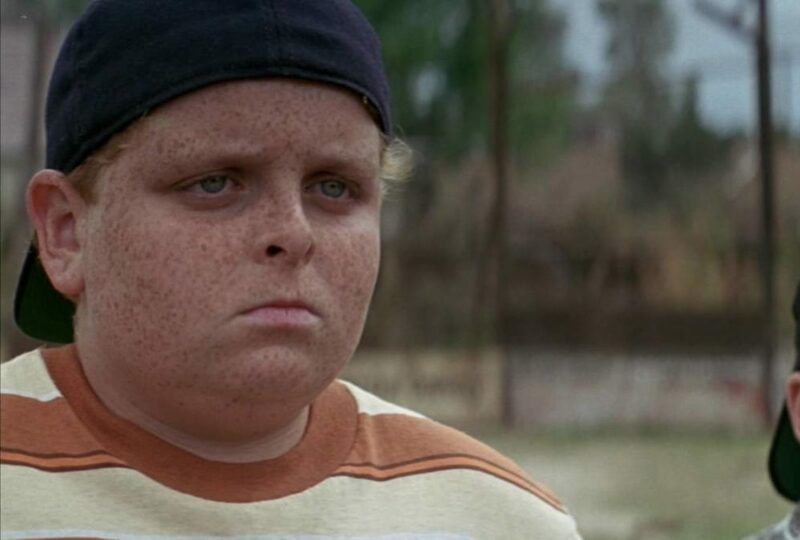 *”You’re killing me, Smalls!” It’s a federal crime to write about “The Sandlot” without quoting that line. **Wendy Peffercorn is a mermaid. ***”The Sandlot” returns to theaters July 22 and 24.